Description This set is made in the new style (as in ICQ 6.5 ), is fully compatible with all standard packets in codes and emotions. All your questions and wishes please leave in comments or use the feedback form. QIP 2005: Find the folder "Smilies" of the skin being used by your client QIP 2005. On folder it is: "C:\Program Files\QIP\Skins\ICQ5\Smilies\" . Delete all the files from the folder "Animated" and copy all the files from the folder "Kolobok BIG series" and paste them into the folder "Animated". Having finished the operation, restart QIP 2005, and you’ll see them in the client. 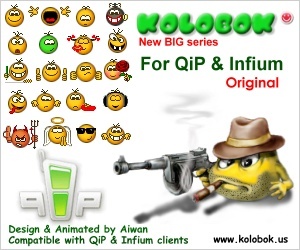 QIP Infium: Find the folder "Smilies" for your client QIP Infium and copy the set of smileys in it. On default it is: "C:\Program Files\QIP Infium\Smilies\". Open "Tools > Interface > Smiles". In the list of smiles choose the folder "Kolobok BIG series". Render time: 0.0981 sec, 0.0115 of that for queries. DB queries: 20.